Our life-size Mexican Cowboy figure is a real western bad-guy! 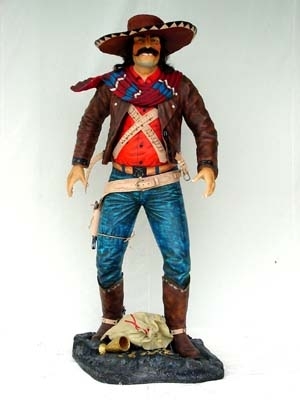 This replica Wild West Bandit statue has a glinting golden tooth and real attitude. This mean-eyed Mexican Bandit stands guard over a sack of gold, he's ready to reach for his guns and shoot to kill! The detail on this life-size model is fabulous. 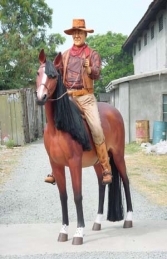 Our 6ft cowboy models can be used to huge effect in any Wild-West area from themed pubs and restaurants to crazy-golf and theme park rides. They are a fantastic way to draw attention to a business or add atmosphere to a party! PLEASE CONTACT US ON 01626 833646 or 07860 680181 TO DISCUSS THIS COWBOY MODEL & THE OTHER WILD-WEST FIGURES IN OUR WESTERN THEME SERIES. PLEASE PHONE US TO PLACE AN ORDER & FOR A QUOTE FOR DELIVERY COST TO YOUR POSTCODE.